The most populous country in Central America, Guatemala is home to more than 16 million people, proud of their shared Mayan heritage but also broadly diverse, with over 24 linguistic groups. Most of the people live in rural areas, although more and more are migrating to urban centers for work. According to data from the World Bank, 54% of Guatemalans live below the national poverty line and 11.5% live in extreme poverty on less than two dollars per day. Food insecurity and chronic malnutrition are pervasive. Despite many challenges that persist, Guatemala has made significant progress on increasing access to drinking water coverage and met the Millennium Development Goal to reduce by half the proportion of people without access to improved drinking water by 2015. According to 2015 Joint Monitoring Program (JMP) data, 93% of Guatemalans have access to improved water, though in rural areas only 87% have access. In line with the global trend, progress on sanitation lags behind progress on drinking water. At first glance, these numbers seem impressive, but they do not provide a complete picture of drinking water access in the country, since many water systems do not meet government standards of water quality and quantity and are in partial or complete failure. Water For People has been in Guatemala since 1997. In the years following its first project, more than 100 water, sanitation, and hygiene initiatives were implemented throughout the country. In 2007, Water For People–Guatemala developed a strategic plan to work exclusively in the department of El Quiché to maximize existing partnerships and staff time. El Quiché was also selected because of its great need: the department has one of the highest levels of poverty in the country and very low levels of water and sanitation coverage. Everyone Forever is a unique programmatic effort to provide water and sanitation to Everyone in targeted districts, Forever. It means these districts and communities never again need another international water agency to address their water challenges. And it provides a model for greater replication, leading to a push for national full water and sanitation coverage. Water For People–Guatemala is focusing its Everyone Forever programming in four municipalities in the department of El Quiché: San Bartolome Jocotenango, San Andrés Sajcabajá, San Antonio Ilotenango, and Santa Cruz del Quiché. These four districts are all located in the Salinas Watershed in the central highlands. Water For People–Guatemala is deeply involved with key local stakeholders, including local municipal governments, the national Ministries of Health and Education, local nongovernmental organizations, the private sector, and local universities. Water For People-Guatemala also participates in the National Commission of Healthy Schools (led by the Ministries of Health and Education) and is on the board of the Water and Sanitation Network of Guatemala (RASGUA). Water For People-Guatemala has also supported the formation of the Association of Municipalities of the Dry Corridor of Quiché (MANCOSEQ), which is a key partner that it allows member municipal governments to share human resources and expertise on topics including water, sanitation, and Local Water Resource Management. The main municipality of the central highlands of El Quiché, it covers 50 square miles and is home to approximately 67,199 in a central town and 81 surrounding villages. The Water For People–Guatemala office is located here, as are departmental offices of the national government agencies. Most people in the rural areas are subsistence farmers or provide day labor. Approximately 83% of the people of Santa Cruz del Quiché are Maya and speak the indigenous K’iche’ language. Many also speak Spanish. Rural municipality with 16,341 inhabitants in 48 square miles who live in the town of San Bartolomé and 32 surrounding villages. Located in the highlands of El Quiché, the communities have elevations ranging from 4,900 to 6,800 feet. Most people are subsistence farmers, producing beans and corn, but some also have livestock. Approximately 98% of those living in San Bartolomé are Maya and speak the indigenous K’iche’ language. A small but densely populated rural municipality with 23,633 people in 31 square miles who live in the town of San Antonio and 33 surrounding villages. In the highlands of El Quiché the average elevation is 6,397 feet. Most people are subsistence farmers but many also produce cash crops and women pursue microenterprise in livestock and specialty fowl. Long distances to markets and lack of transportation are challenges. Approximately 99% are Maya and speak the indigenous K’iche’ language. A remote rural municipality with 47,179 inhabitants dispersed throughout 172 square miles who live in the town of San Andrés and 119 surrounding villages. Located in the highlands of the department of El Quiché, elevations of the communities range from 3,280 to 6,561 feet. Most people are subsistence farmers, producing primarily corn and beans. A few families also have livestock, and some produce woven-grass crafts. There is an alarmingly high child malnutrition rate of 21.1%. Approximately 86% are Maya and speak the indigenous K’iche’ language. Water For People-Guatemala promotes replication of the Everyone Forever approach through participation in national networks such as the National Commission of Healthy Schools, the Water and Sanitation Network of Guatemala (RASGUA), and the Global Water Partnership. Water For People-Guatemala is also exploring the potential to scale Everyone Forever through local and national associations of municipalities. A key to this strategy is working closely with the mayors of the districts where we work and the Association of Municipalities of the Dry Corridor of Quiche (MANCOSEQ). Water For People–Guatemala is rethinking the way conventional school programming is implemented. Traditionally, schools have been the weakest link in programs: teachers are often underpaid and overworked; those who have received hygiene education training often leave for better schools; and school administrations have limited or nonexistent funding. School-focused programs often become graveyards for broken water systems and dirty, unused latrines. To address this, Water For People–Guatemala treats schools as part of the wider community along with local parent associations, governments, and development organizations. Each school intervention is combined with water and sanitation solutions and hygiene education in the associated community, ensuring that hygiene practices taught in schools are reinforced at home. Responsibility for financing and maintenance of the school water and sanitation system is placed on the community and local government, thus taking the burden off the often overwhelmed and underfunded schools. 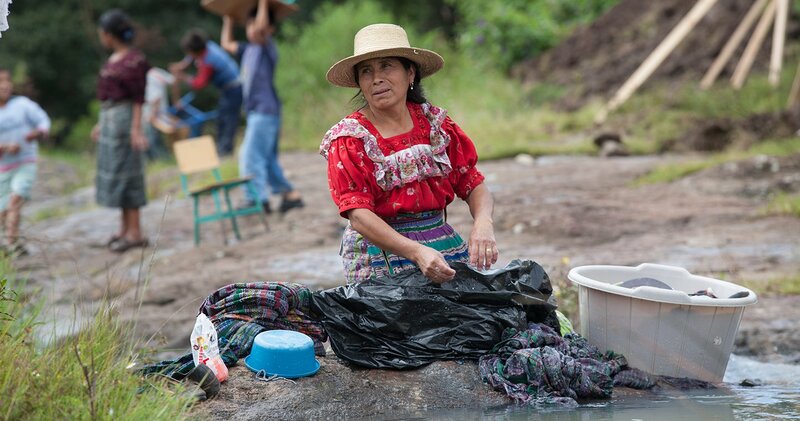 Water For People–Guatemala’s SWASH+ work has rightfully gained national and international attention. Water For People–Guatemala’s work has been recognized by the Pan-American Health Organization and World Health Organization for its excellence. Water For People–Guatemala’s hygiene education methodology of creating classroom hygiene corners has been adopted in Honduras and Nicaragua. In the municipalities of the Salinas Watershed, communities are experiencing water shortages, due in part to the effects of climate change. Some springs in the area no longer produce the same quantities of water as in the past. Increasing demand for potable water from communities, combined with the decreasing amount of available water, presents a difficult future. Because of the lack of surface water sources, some communities have begun to drill wells, which involve higher costs and the need for groundwater management plans. Water For People–Guatemala is collaborating with the municipal government, the National Institute of Forests, and the Quiché Water and Sanitation Network (RASKICHE) to align local efforts to protect the watershed. Current watershed-focused activities include experimentation with payments for environmental services (whereby a portion of the water fees collected are used for watershed activities), promotion of community and municipal tree nurseries, Local Water Resources Management (LWRM) training with municipal authorities, and promotion of household metering and tariff structures based on use to promote water conservation and equitable payment. In 2016 Water For People-Guatemala will continue to collaborate with municipal governments, community members, and other local partners to increase water and sanitation coverage in its four target municipalities. Programming will include extending water systems to make sure 95% or more of communities have access; increasing the number of systems that meet water quality standards though promoting water quality monitoring and control; and constructing or rehabilitating community water systems and school water and sanitation infrastructure. Programs will emphasize sustainability through working with community water and sanitation committees to encourage implementation of tariffs sufficient to cover operation and maintenance costs plus a percentage of projected major repairs and replacement costs. This will take place through water committee fairs and exchange visits and use of the At What Cost tool. Market-based programming will include working with local micro-finance institutions and cooperatives to promote loans for community water projects and household sanitation construction. Water For People-Guatemala will begin to operationalize a new Sustainable Sanitation Strategy created in 2016, which includes strategies to replicate and scale current approaches as well as to generate greater demand for sanitation through providing sanitation promotion spots on radio and TV with coverage beyond our four Everyone Forever districts, and working with sanitation businesses and micro-finance organizations who work regionally and nationally. Water For People-Guatemala will continue to implement the “El Quiché program,” a joint initiative with ONE DROP launched in 2015, which will run through 2019. This program incorporates a component of social arts into programming, employing the creativity of local artistic groups to catalyze behavior change on water, sanitation, and hygiene themes including sanitation demand creation, handwashing, and payment for water services to ensure long-term sustainability.